Background: Hematological values of the newborn babies vary according to the gestational age and intrauterine growth. Objective: The objective of this study is to compare the iron status and red cell parameters in healthy term small for gestational age (SGA) and appropriate for gestational age (AGA) neonates . Materials and Methods: A prospective hospital based study was conducted in a tertiary care teaching institution of central India. 50 AGA and 50 SGA neonates were included in the study and serum iron, serum ferritin and red cell parameters (hemoglobin (Hb), red blood cell (RBC) count and hematocrit (Hct), mean corpuscular volume (MCV), means corpuscular hemoglobin (MCH), mean corpuscular hemoglobin concentration (MCHC) and red cell distribution width (RDW]) were estimated within 24 h of birth. Results: Serum ferritin levels were significantly low in SGA neonates as compared with AGA (mean 103 vs. 158 ng/ml; P=0.001) neonates. In SGA neonates, mean values of Hb (P=0.001), RBC count (P=0.018) and Hct (P=0.005) were significantly higher than in AGA neonates. Higher values of RDW and MCV were seen in SGA group in comparison with AGA neonates. Similarly, lower values of serum iron, MCH and MCHC were seen in the same group; although, these were non-significant. Conclusion: Despite higher Hb content, SGA neonates are deficient in iron store at birth as indicated by lower serum ferritin levels in them and early iron supplementation should be considered in them. 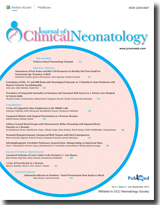 Objective: To correlate electroencephalogram (EEG), computed tomography (CT), and magnetic resonance imaging (MRI) brain with neurological outcome at 12 months in term neonates with hypoxic ischemic encephalopathy. Design: Prospective observational study. Setting: Neonatal intensive care unit (NICU) in a tertiary care teaching hospital. Materials and Methods: The study was conducted between June 2010 and November 2011. Consecutive term neonates with perinatal asphyxia and hypoxic ischemic encephalopathy were the subjects. All babies were managed as per standard protocol. EEG was done as soon as the baby was stable and CT brain within 7 days. MRI was done at 3 months. Neurodevelpmental assessment was done at 12 months. Results: Of the 31 babies, four died and one was lost to follow-up. Neurodevelopmental at 12 months of age was normal in 15 babies. EEG was normal in six babies and all of them had a normal neurodevelopment. Thirteen of the 14 babies with burst suppression pattern were abnormal (P<0.001). CT brain was normal in 14 and all of them had normal neurodevelopment (P<0.001), while 11 of the 12 with cerebral edema had abnormal outcome (P<0.001). Of the 16 babies with normal MRI, 14 were normal, while all six babies with abnormal signals in the cortex and thalamus had abnormal outcome (P=0.002). Conclusions: A normal EEG and CT brain in a term newborn with hypoxic ischemic encephalopathy (HIE) is associated with good neurological outcome. Burst suppression pattern in EEG, bleeds, or hypodensities in the CT and involvement of basal ganglia/thalamus in the MRI are predictors of abnormal outcome. Background: Congenital anomalies are a major cause of stillbirths and neonatal mortality. The pattern and prevalence of congenital anomalies may vary over time or with geographical location. Aims and Objectives: The aim of this study is to determine the proportion and types of congenital anomalies in live newborns and to study maternal and perinatal risk factors. Materials and Methods: This cross-sectional descriptive study was carried out in the neonatal care unit of R. G. Kar Medical College and Hospital during the period of September 2011 to August 2012. All the live born babies born in this hospital during this period were included. The newborns were examined for the presence of congenital anomalies and mothers were interviewed for socio-demographic variables. Results: During the study period, 12,896 babies were born, of which 286 had congenital malformations, making the prevalence 2.22%. Most of the women (55.7%) belonged to the age group between 21 and 30 years. Congenital anomalies were seen more commonly (3.3%) in the multiparas in comparison with primiparas (1.8%). The predominant system involved was Musculo-skeletal system (33.2%) followed by gastro-intestinal (GI) system (15%). Talipes (17.1%) was the most common one in musculoskeletal group and likewise cleft lip and cleft palate in GI system. Congenital anomalies were more likely to be associated with low birth weight, prematurity, multiparity, consanguinity and cesarean delivery. Conclusion: Public awareness about preventable risk factors is to be created and early prenatal diagnosis and management of common anomalies is strongly recommended. 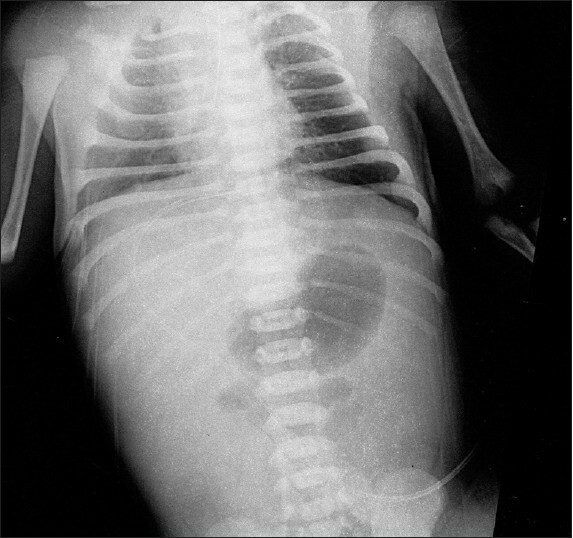 Congenital lobar emphysema (CLE) is a rare cause of respiratory distress during the neonate period. It is characterized by overinflation of pulmonary lobe, most commonly the left upper lobe or the right middle lobe. We report a case of a 21-day-old baby with the severe respiratory distress. Diagnosis of CLE was made by computed tomography scan and chest X-ray and confirmed by histopathological studies. We would like to draw attention to this rare condition, and discussing their clinical features and management. Congenital malaria (CM) is a rare disease with only about 300 cases reported so far. In general, it presents with fever along with other common features such as jaundice, anemia and hepatosplenomegaly. We report a case of CM who presented atypically without fever along with other typical features. 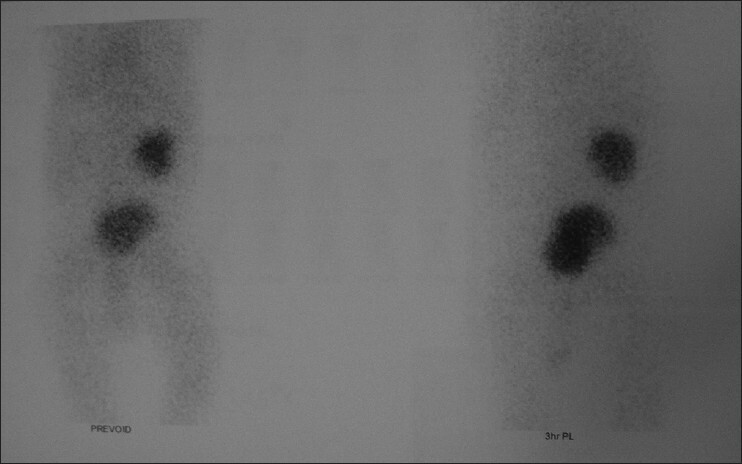 Solitary crossed renal ectopia (SCRE) is an exceedingly rare anomaly of the urinary tract. So far, only 34 cases have been reported in the literature. It usually presents after infancy. Most of these cases are diagnosed incidentally while patients are undergoing evaluation for associated genitourinary, cardiovascular, hematological or vertebral abnormalities. We report the first case of SCRE presenting in neonatal age with impaired renal function and vesico-ureteric reflux. We report a case of fatal intra-abdominal bleeding in a term newborn delivered by vacuum extractor and Kristeller manouvre. Although autopsy was not performed in compliance with the parents' wishes, there is strong evidence of a massive abdominal haemorrhage due to injuries of the hypochondriac organs probably leading to disconnection of a vascular pedicle. Pulmonary sequestration is a rare malformation, wherein a portion of lung is non-functional and is not in normal continuity with the tracheo-bronchial tree, and may derive its blood supply from systemic vessels. Two types are described: Intralobar and extralobar types. Intralobar sequestration is more common type, which shares visceral pleura of the involved lobe and is localized within the normal pulmonary parenchyma. Whereas extralobar forms are uncommon and are totally separate from the lung and usually have own covering. 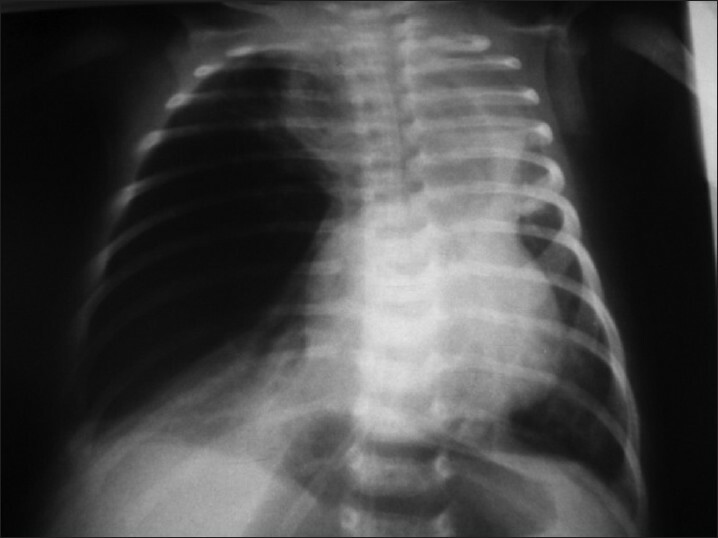 Infra-diaphragmatic pulmonary sequestration is of extralobar type and is extremely rare, and usually is associated with other congenital malformations. 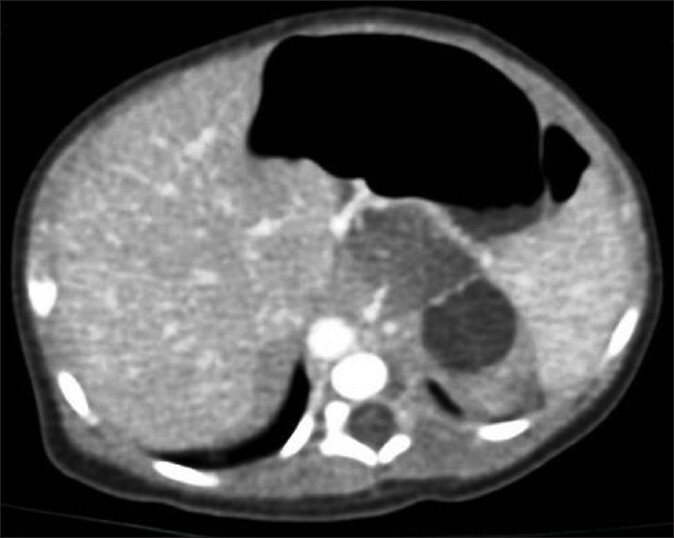 We present an extremely rare case of isolated infra-diaphragmatic pulmonary sequestration which was antenatally detected and followed up with postnatal CT scan, where it masqueraded as suprarenal mass, and was surgically treated. This case emphasises to add a differential diagnosis of malformation in congenital supra-renal masses, which remain stable in size and appearance, and hence avoid immediate surgery. 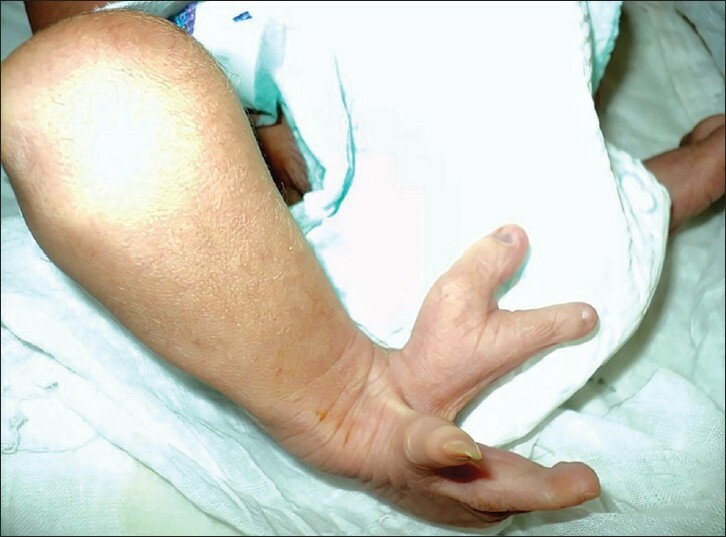 The limb ischemia is a rare phenomenon in the newborn. It is most often a postnatal ischemia secondary to arterial or venous catheterization, to neonatal infection. Maternal diabetes is most often implicated. The diagnosis implies an urgent situation which may result in extremity gangrene and ultimate loss of limb. Ectrodactyly also known as Split hand/foot malformation is a rare limb malformation with autosomal dominant in heritance with variable penetrance, commonly known as "lobster claw hand". Usually it involves midline clefts of the hands and feet with syndactyly. We report a neonate with ectrodactyly and brief review of literature of condition.